Search in MailMate works great in terms of accuracy, but is a bit slow with ~65,000 messages (searching "common headers or body", which is the most resource-intensive search option, but I prefer to search everything from one field a la Spotlight). Search in the web interface for FastMail (my email provider) is both accurate and very fast. So why not use FastMail for searching and MailMate for everything else? 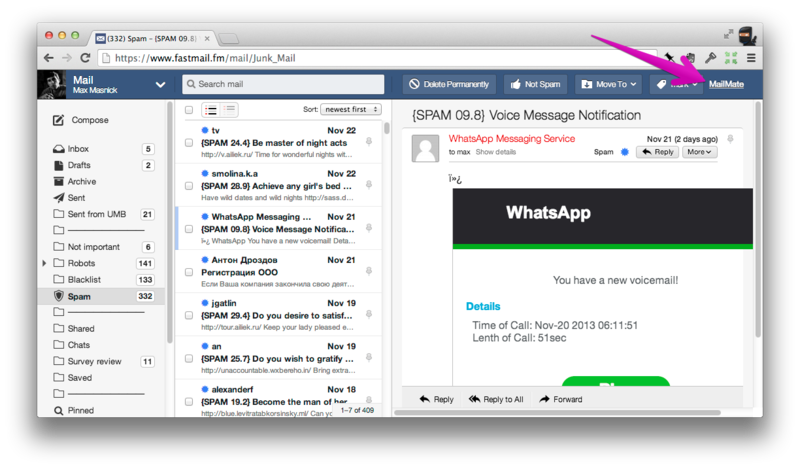 To this end, I made a quick-and-dirty Chrome extension for adding a "Open in MailMate" link to FastMail's web interface. No guarantees this will work for you because it's quite a hack. It has to load the raw message via an XHR request and then find the "message-id" in order to build a message:// URL that will trigger MailMate. When MailMate opens the message, you can use the Message > Go to Source menu item to show the message in context (possibly followed with showing all messages in a thread). Head over to GitHub to grab the extension.